We are delighted to publish this guest post by Esther Brot, who is currently pursuing her PhD in History at King’s College London. She is writing her dissertation on the topic of the Corporation of London and the prisons of the City of London in the long eighteenth century. In 1717, the Court of Aldermen appointed Carleton Smith as the keeper of Jacobite rebels in Newgate Prison for a limited term to prevent further escapes by the Jacobites. A conflict over power between Smith and the warden of the gaol, Mr. William Pitt, resulted from this appointment. This blog post will use the “Diary of Newgate Gaol by Carleton Smith, Keeper of Newgate”  in order to discuss the blurred lines of authority between the Court of Aldermen and William Pitt. This diary is a record of the second time that the Court of Aldermen appointed Smith to see to the safe-keeping of the Jacobite prisoners. Carleton Smith was an emissary for the Court, a physical manifestation of its power. In 1716, Mr. Pitt was arrested for high treason; he was accused of abetting Jacobite prisoner Thomas Forster’s successful escape under his own watch. While Pitt was jailed leading up to his trial for high treason, his “Chief turnkey” Mr. Rouse cared for the prisoners from April 10, 1716. However, many Jacobite prisoners escaped while Rouse acted as the head of Newgate. So, the Lord Mayor appointed Carleton Smith to “care” for the Jacobite prisoners in Newgate; once Pitt was acquitted on July 14, 1716 of high treason, Smith was discharged. After the escape of George Flint in March of 1717, the Court of Aldermen and Lord Mayor appointed Carleton Smith to “care” for the Jacobite prisoners once again. However, this time Pitt remained the head of Newgate. The diary and this blog post discuss this second appointment because it is during this appointment that Pitt and Smith directly clashed. Before Smith was a substitute for Pitt, not someone who both ranked beneath Pitt and also alongside him. From inception, Smith’s duties entailed overlapping jurisdictions. Smith answered to the Corporation and to Pitt, but who was the ultimate authority? 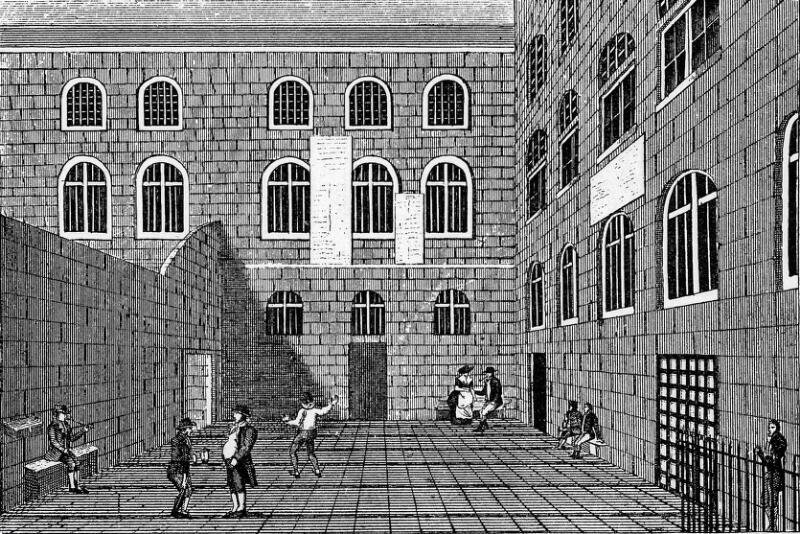 ‘Newgate Prison, Inner Court, 18th century.’ Credit: Wellcome Collection. CC BY. Smith’s diary, of his second time as keeper, details routine activities: lock-downs and the contingents of soldiers guarding the Press Yard. Smith only dealt with the Press Yard, the portion of the prison reserved for higher-ranking inmates that abutted the lodge, the warden’s dwelling. Smith answered to the gaoler of Newgate and the Corporation of London, specifically the Court of Aldermen, the Lord Mayor and the Sheriffs of London. His job was to see to the safe-keeping of the Jacobite prisoners, assist the gaoler of the entire prison [Mr. Pitt], and oversee the underkeepers, turnkeys and soldiers that dealt with the Jacobite prisoners. From inception, Smith’s duties entailed overlapping jurisdictions. Smith answered both to the Corporation and to Pitt. Sawey blockhead.” Clearly Pitt believed his authority superseded Smith’s despite the Court of Aldermen’s appointment of Smith. Smith considered this “rough” treatment, especially because Smith was fulfilling obligations as a specially appointed keeper. As Smith’s actions instigated confusion over power, so did Pitt’s when he ordered Smith to look after prisoners on the Master’s Side, a portion of the prison not connected to the Press Yard. Smith answered by referring back to his duties: his jurisdiction only existed in the Press Yard where the Jacobite prisoners were. Smith could only watch over these other prisoners if they were brought to the Press Yard. While technically Smith’s superior at Newgate, Pitt did not set the parameters of Smith’s job, the Aldermen did. It was unclear where the boundaries between Pitt’s and the Court of Aldermen’s authority lay, producing ambiguity over Smith’s position and creating the conflict between Smith and Pitt. Smith reported these instances to the Lord Mayor and Court of Aldermen requesting that his power be independent from Pitt’s. Understandably Smith wanted his own authority, which would clarify the boundaries between Pitt’s power and the Court of Aldermen’s in regard to Smith’s domain. Despite reassurances from the Sheriffs that Smith would have his own authority, it was not granted. Tension continued to exist between Smith and Pitt on gaol governance throughout Smith’s keepership. The Jacobite prisoners themselves still petitioned Pitt for rights, such as the right to bait badgers in their yard, implying that Smith did not have ultimate authority over the Jacobites. The issue of what authority Smith actually held, caused problems with lower-ranking prison officers as well. The turnkeys did not always follow Smith’s orders relating to the treatment of the Jacobite prisoners. The Court of Aldermen granted Smith the right to oversee underkeepers, turnkeys and soldiers that dealt with the Jacobite prisoners. But whether turnkeys answered ultimately to Pitt or Smith in regard to the Jacobite prisoners is unclear. Pitt’s turnkeys assisted Smith and his assistant with locking up. The turnkeys did not always act to the standard that Smith desired: they spent too much time with the prisoners socializing. Smith “spoke” to them about their behavior, but the turnkeys did not always correct their actions. The diary is a unique record of active aldermanic intervention into daily prison operations. The regular pattern of the Court of Aldermen and warden’s relationship was one of non-intervention. The Court of Aldermen was the official oversight agency of the City of London with the right to appoint and dismiss wardens. The Court answered complaints and petitions from prisoners and prison officers alike relating to abuse by wardens, starvation, medical treatment, and so on, solving the problems brought to its attention and paying bills relating to prison infrastructure and poor prisoners’ welfare. The Court played a reactive rather than active role regarding prison operations and did not intervene in the wardens’ realm unless a complaint pushed them to. Wardens were not obligated to pay for poor prisoners’ or medical care, a main area of the Court of Aldermen’s actions in prisons. The escaped prisoners forced the Court to intervene in Newgate for a long period because it could not be solved by a suspension of a prison officer. The Court limited Pitt’s authority by appointing Smith, but at the same time did not question the scope of Pitt’s authority in the prison. The Court removed one group of prisoners from the number Pitt had to keep in safe custody directly (via himself or his employees), but did not remove the prisoners from his indirect management. The Court also did not grant Smith independent power from Pitt as Pitt still had the ordering of Carleton Smith. In theory, Smith stands as the embodiment of the Corporation’s right to intervene in prisons. In reality, Smith embodied the convoluted overlapping jurisdictions of authority between the gaolers and the Corporation. After the Jacobite Rising in 1715, the failed effort to reclaim the English, Irish and Scottish Crowns for the House of Stuart, a number of the high-ranking rebels were imprisoned in the Press Yard of Newgate Prison. Originally the gaoler or keeper of the entire gaol, Mr. Pitt, oversaw their imprisonment. William Pitt was appointed warden of Newgate Gaol on December 16th, 1707 (Court of Aldermen Repertories, Repertory 112, mcfp/0861, 31). Old Bailey Online, The Trial of William Pitts (July 1716); The Secret History of the Rebels in Newgate Giving An Account fo their daily Behaviour, from their Commitment to their Goal-Delivery (Warwickshire: J. Roberts, 1717), 9-11, 26-27, 30-32. Pitt’s behavior towards the Jacobite prisoners was considered too liberal. With Forster he permitted to many liberties; he also socialized with Forster and other of the Jacobites. (Old Bailey, The Trial). This pattern continued after Pitt’s acquittal and when Smith again saw to the safe-keeping of the Jacobites. Pitt’s turnkeys also socialized with the Jacobite prisoners, drinking and eating with them; which Smith attempted to prevent, but the turnkeys did not listen to him (London Metropolitan Archives, CLA/035/02/001, “Diary of Newgate Gaol by Carleton Smith, Keeper of Newgate,” 12-3, 33, 53-55). These behaviors helped potentiate escapes, and made Smith’s presence and job important for the continued safe-keeping of the Jacobites. London Metropolitan Archives, Court of Aldermen Repertories, COL/CA/01/01/109-137. Thanks, John – hopefully that should work now!